First few posts will re-post what's been done on the burner construction. And then new posts will be added. I tried a few things this morning before the rain started. I found a 20' 1/4" ID propane hose I had in storage from a boat stove, UL rated at 350PSI. 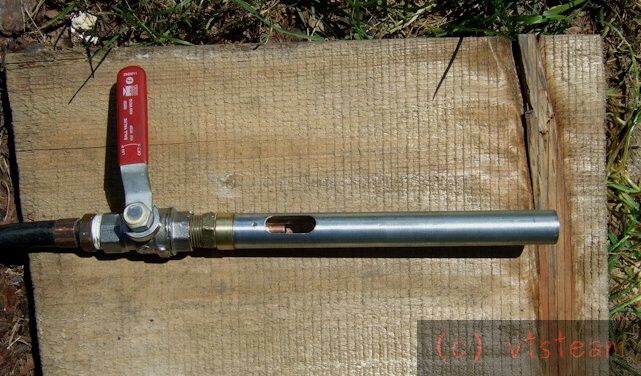 Thinking about using this for a brazing torch, but I wanted to attach it to an acetylene regulator and gauge and run at maybe 15 PSI. I want a steady regulated pressure. Unfortunately the ends were M and F compression fittings while the regulator was B type left hand thread. Then I found an old cracked OxyAcet twin hose, no longer useful -- I was hanging on to it for no obvious reason. But of course I now realized the end connectors were still in fine shape, and there were 2 B type left hand connectors on the red hose -- oh boy! I split the crimped ferrule with a Dremel tool, leaving the end swivel portion intact. As I thought, under the ferrule in the hose was a nice 1/4" hose barb end. So I figured I could mate that lefty B connector with hose barb to my 1/4" propane hose. but unfortunately I didn't have a small enough hose clamp to fit the hose. Actually I want two on this connection for security -- and they need to be the full round type. So couldn't go any further. Maybe I'll go to town and get clamps tomorrow. Then I thought I'd try firing up my Harbor Freight weed burner and testing it as a brazing torch. It puts out massive heat. For the test, I took a piece of 3/8" plate and set a piece of 1/2" water pipe on it. I ground them both clean beforehand. I figured the torch could easily do the job, but after a couple minutes of heating -- even up to the point where the pipe was glowing red in daylight, I couldn't get the braze to flow on the plate -- not sure if it was a fluxing issue or a gas mixture issue. I hadn't used much flux in the joint and hadn't fluxed the rod. It was definitely hot enough to melt the brazing rod, but it stayed on the plate like a little worm. I'll have to repeat that again when the rain stops, with a flux coated rod. But it was clear the flame was just too massive and spread out to be much good as a brazing torch. Very wasteful. I unscrewed the head, which measured a whopping 2-3/8" ID (! 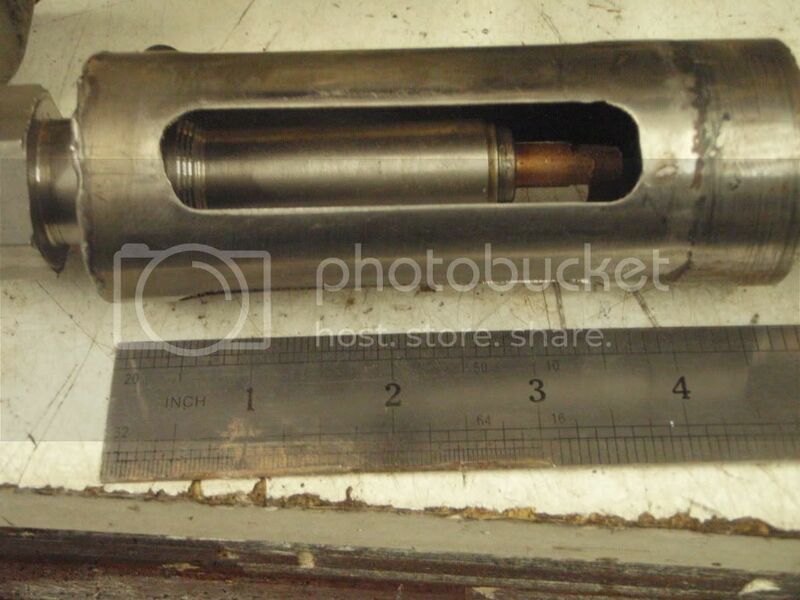 ), and checked the bore of the jet, which was .060". Also huge. I think I'd like to make a torch about 1/2" to 3/4" ID with a much more concentrated flame with a jet orifice somewhere around .040. Also, as I said, with an adjustable regulated propane supply. The weed burner is direct connected to the propane tank. It does have a good handle, valve, wand, and trigger, so might make a good starter assembly for my brazing torch. But the head will need to be quite different. I got a little time today to work on a brazing burner. First I did quite a bit of web research on burners -- Reill, Oliver, T-Rex/hybrids, Gypsy Tinker's Mako, etc. For starters I'm going to try a Mako type because of its simplicity, light weight, and narrow profile (useful for what is intended to be a hand torch), plus its reported good behavior and good turn down ratio. I'll probably modify things along the way, and I'm keeping in mind features of the other burners I've looked at, which may come in. Plus I like working with scrap electrical conduit and fence rail tube. Don't know why! In this case though, light weight and less restrictive porting with thinner walls are small advantages, maybe. 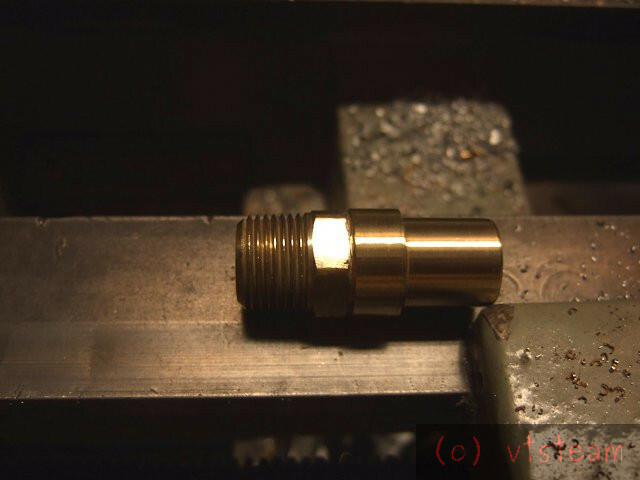 I turned a scrap of Brass down to make it a tight sliding fit in 1/2" electrical conduit, with a shoulder, and drilled it 1/4" to fit a mig contact tip. 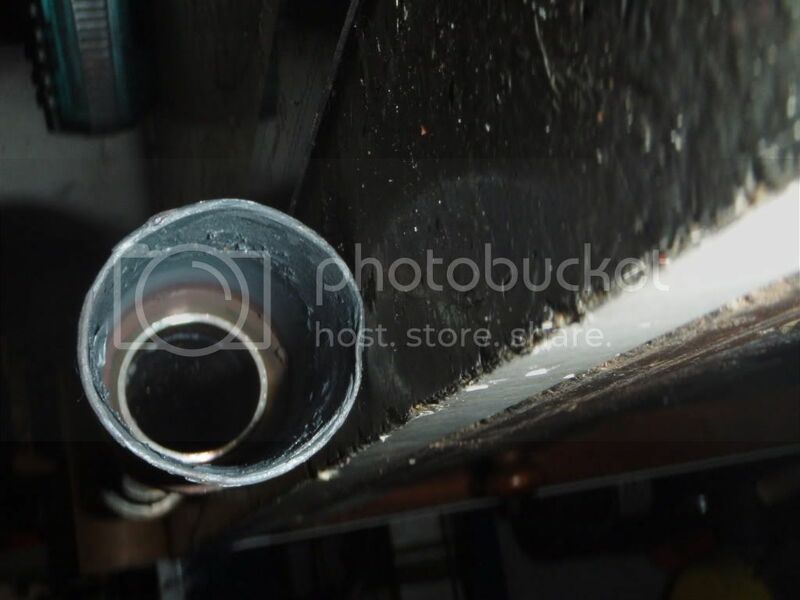 Because the piece wasn't long enough to thread the gas connection end, I rummaged around in my old plumbing fittings box and found a compression to 3/8" pipe thread bushing. I sawed off the compression side, and faced it, leaving the hex shoulder and the pipe threads. Then I took them outside on the porch, set them on a firebrick, fluxed both parts and cut little strips of silver solder to put in the joint. I set one on top of the other with the solder sandwiched in between, heated with a handheld Mapp torch, and It was able to do the job. The pieces came together and the solder wet out very nicely. I cleaned up a piece of 1/2" conduit and fitted the end in. It was a tight sliding fit. Then I drilled for tapping for a #6 set screw right through both the outer casing and the brass fitting. The set screw will allow adjusting the position the MIG tip in the brass fitting, as well as lock the outer casing to the steel tube shell. I tapped the burner base and installed a .030" mig tip. 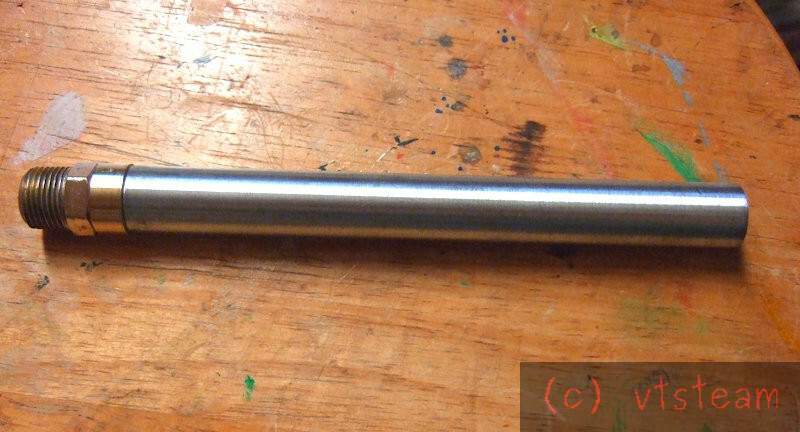 I also milled two 3/8" x 1" air ports lengthwise on the barrel. That's different than a Mako burner which as radially milled ports, so I wasn't sure what to expect for performance. I guessed that the open area was roughly equal to that in the Mako design. The slots are similar to the Hybrid burners like the T-rex, but those feature a much larger barrel and venturi, and the nozzle orifice is forward of the slots. I connected the propane hose to the tank and regulator hose barb using 2 new proper size hose clamps, and connected the other end to a gas ball valve and then to the burner base. I tried a lot of experiments today with the new burner. I tried it with and without a flare, with different amounts of flare in the flare (!) with different mig tip positions, and lengths, and with and without the three 1/4" holes in the end of the main barrel, which appear on the Mako design. Pressures ranged from 2 to 15 PSI. To summarize, the burner definitely requires a flare in free air, and the flare should be flared. The tip position was best with this design placed far forward near the end of the air slots. That is different than the Mako design which positions the orifice in the middle of the air slots. 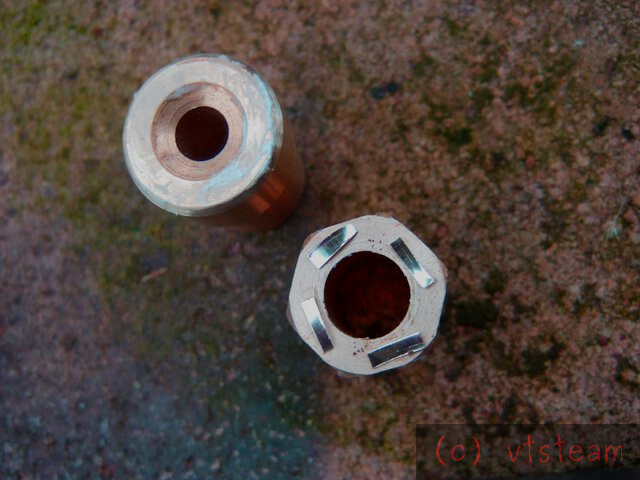 But, of course those slots run radially, not axially. The burner worked very well, though I think the flare needs more flare currently to increase stability at the higher pressure end of the range, and in wind (It was very blustery today -- not actually a good day for testing). It puts out a lot of heat, but it is diffuse heat compared to a hand held torch, which really focuses a flame. 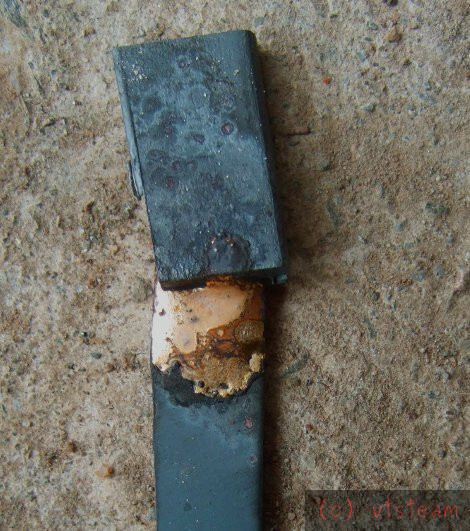 For that reason, it never was able to do more than soften brazing rod rather than really fuse it to base metal despite the fact that it was producing lots of heat and flame. I'm sure it would be a fine burner in a forge or foundry where insulation could allow a rapid temperature rise, radiant wall heating, and contain the flame. But in open air playing against metal it was just too big a flame to reach good brazing temperature. I'd rate this burner as a success as a massive and efficient heat source, but a failure as a hand held brazing torch. Focusing an atmospheric flame is something I want to find out about. It's really clear to me that we have enough heat and a high enough temperature to easily braze with, but that heat is scattered over a very large flame. 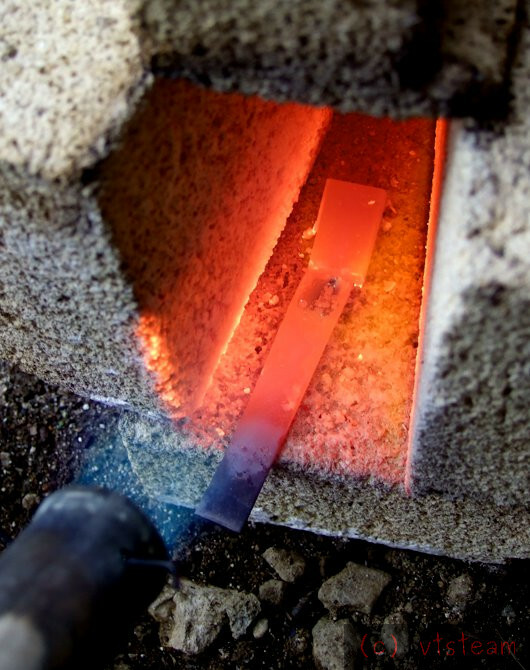 As a result it cannot raise a local temperature high enough to melt brazing rod. One way of concentrating and collecting that heat in a small space is by enclosing it. Thus a brazing hearth. Here's a very simple hearth I put together to test this method with the new torch. 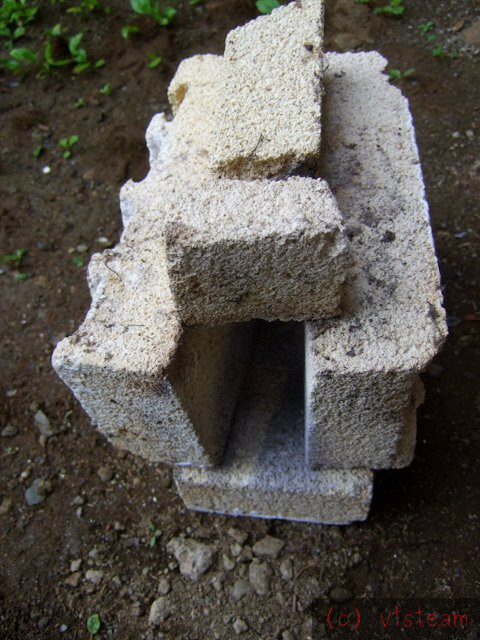 A few pieces of used insulated firebrick stacked together. Not a pretty job, but it was just a couple of bandsaw cutoffs laid on top of each other, and had they had been subjected to many previous tests, thus the heavy oxide layer. It may be that my torch has an excess of oxygen however, which is easy to control with a choke. Early on it had an oxygen deficit and the first flames had a bit of orange in the feather. I was considering opening up the slots or adding another. However, repositioning the gas orifice and adding flare to the flare made this unnecessary. I have 4 hand held canister gas torches -- 2 older propane versions and 2 Mapp types. All 4 have an insert located an inch or two from the tip. As a guess they act as flame holders, as mixers, and as flow straighteners to keep the flame size compact. That's a guess. 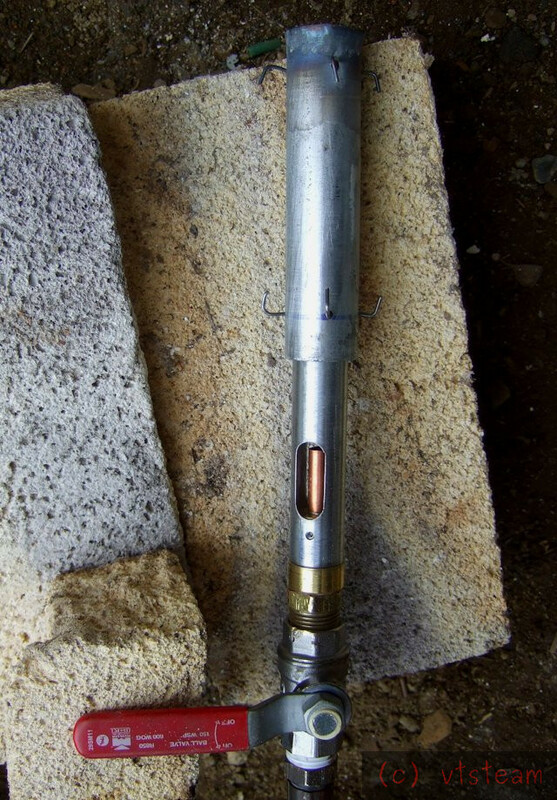 The mapp gas torches (Bernzomatic) have a newer style "swirl" insert which consists of 4 angled vanes. The tip of the torch has a reverse flare (constriction). 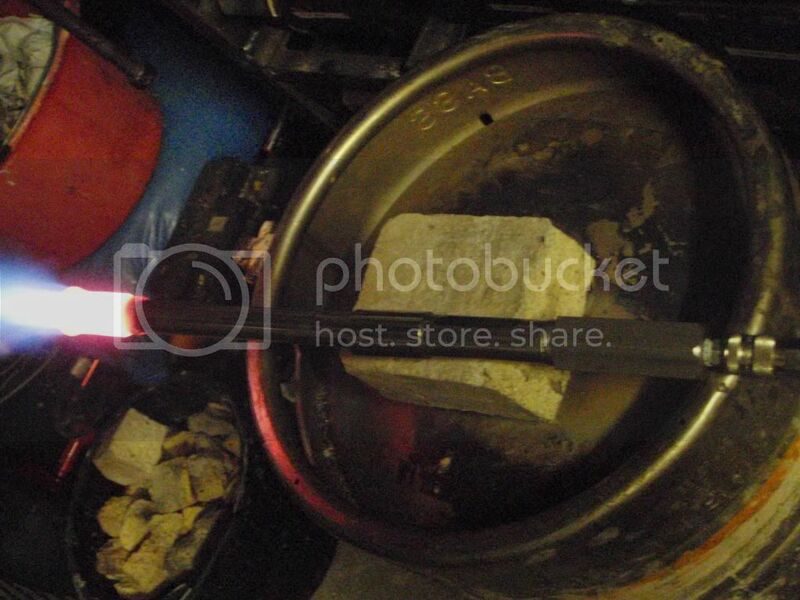 I think I will try to make some inserts for my shop made torch to see if I can reduce and concentrate the flame. Hi Neo --- do you mean a slide restrictor over the air slots? That would just enrich the flame, I think -- which would be useful for settings where the flame was tending to lean out. But I don't think it would concentrate the flame into a smaller space, which is where I want to go. Maybe you mean something inside the bore -- which is what I'm going to try next -- but that would be a mixer. I think the key to reducing flame dimensions (and increasing local heat intensity) is better mixing. I think flame size is in inverse proportion to mixing efficiency, and in proportion to exit velocity. So I would like to slow down the exit speed, and increase the mixing efficiency before the gasses burn. I think they will burn in a smaller space that way. A third consideration would be shaping the gas "bundle" as it exits. I thin k the commercial practice of a perforated or vaned insert is what does most of the above three things. Ac tually, if you want to think about it in this way, a hearth also does exactly those same three things. It mixes through turbulence in a smaller space, slows the flame and shapes it. It also insulates and generates IR radiation, but that is an additional help not available in a pure atmospheric torch. Enjoy your topic, been experimenting with a handheld torch/burner myself. Based mainly on M Porter design, but with added features. And knowing that a turbulent flame burns hotter. I went about it in this way. Presuming the sizing of the jet/ burner tube i.d./ burner tube length, are O.K. Found that in free air a stepped flare gives a more stable flame over a bigger range. At first the flame was too long and laminar, so needed to create turbulance. Drilled holes 3X near the end of the burner tube, and created a key-hole shape. By opening a slot, towards the end of the tube. The i.d. of the flare will cover the key-hole shape holes. On the inside the holes create turbulance and hence better mixing. Turbulance speeds up the chemical reaction during combustion. Thus creating a hotter and more concentrated flame. Great dranoel58! And welcome to the forum! Do you have any flame pictures? Have you brazed with it? Also, what is M Porter design? A very good book on burners. 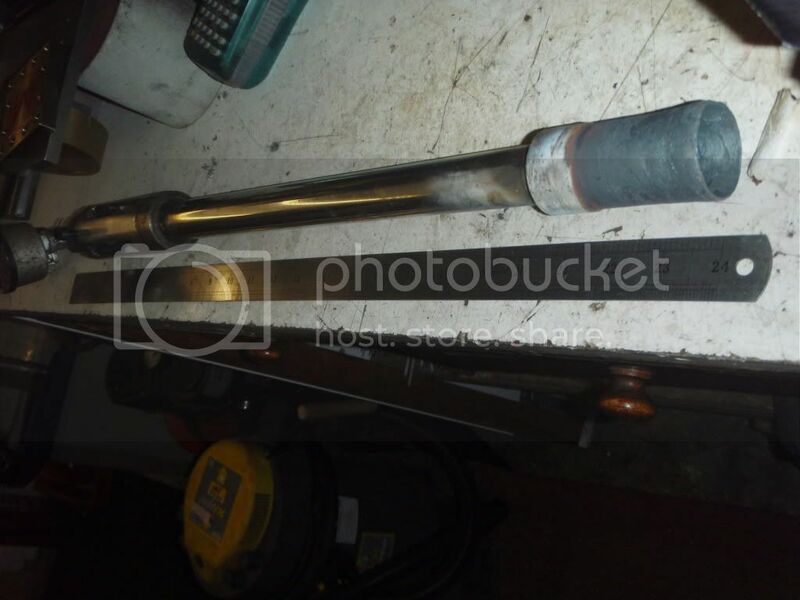 Some pictures of my early "furnace torch"
A bazooka! Nice big burner, john. I Imagine you did some melts with that one! Thanks for the welcome, vtsteam. The picture was taken before the modification on the turbulance slots. Wich have made a big improvement. Now it is a shorter, brush like flame. The flame seems to hug the heated object more. As far as your brazing question goes, the answer is no. That would be streching things too far, for propane/air I think. Nitrogen content in air, too much of a heat-sink. mattinker answered your other question about M. Porter. Have not read the book, but a lot of his info on the net. Proffesor Google got his name. 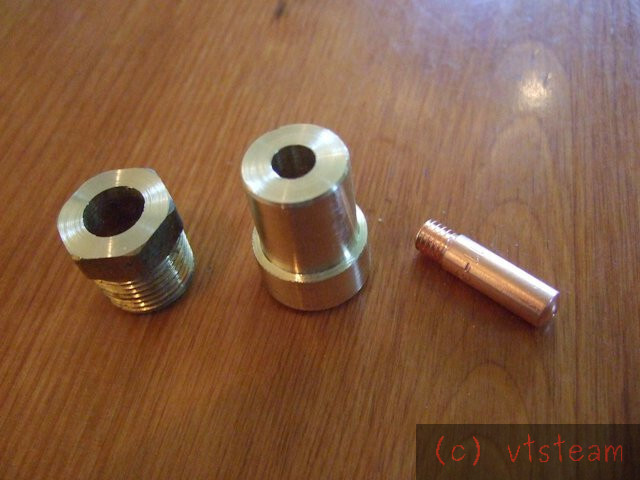 Mike Porters design are capable of brazing temperatures!